The animals showed this anticipation by “spy hopping”, the action of peering above the surface and looking in the direction that trainers usually approached from. The lifting of that ban was a huge relief for Birgitta Mercera, who runs the dolphinarium. She told the BBC that allowing the dolphins to breed, to raise their own offspring, was a critical part of what she suggested was a happy – though very different – life from that in the wild. “I think that wild dolphins are happier in the wild, and captive-born dolphins are much happier in captivity. Talking to Ms Mercera and the trainers at Parc Astérix – who clearly adore the dolphins – and observing the aquatic mammals, it is easy to conclude that they have happy lives. 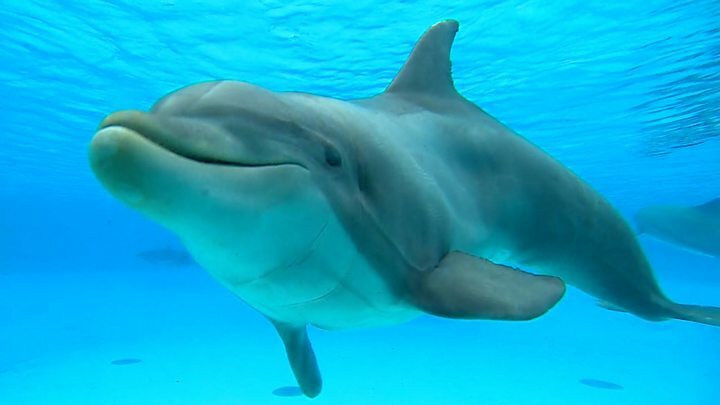 But Dr Susanne Schultz from the University of Manchester, who has studied the social behaviour of wild marine mammals, points out that the study cannot tell us “if a dolphin in captivity is happier than it would be if it was in the wild”. “I do think it’s a valuable finding that dolphins in captivity potentially seek out contact with humans,” Dr Schultz added. “And I think that finding can be applied to how we manage other charismatic, intelligent species. According to the UK charity Whale and Dolphin Conservation, there are at least 3,000 cetaceans – the group of “toothed whales” that dolphins belong to – in captivity in 50 countries around the world. Dr Clegg estimates that there could be as many as 5,000, as some animals are not officially registered. In addition, in the more than 150 years since the first whales and dolphins were brought from the wild and into aquariums, scientists have learned a huge amount about their intelligence and complex social lives. Dr Clegg says that, rather than answering the question of whether it is right or wrong to have these animals in captivity, she hopes the findings will help improve the lives of those thousands of animals that will spend their lives in dolphinariums. “I think the question of whether they should be in captivity is really important and we should be asking it at the moment,” she says. “And it has two elements: are the animals in good welfare? And what is their purpose? And we have to look deeper into the animals’ behaviour to understand how they’re feeling.